26 April, 2006 / The old guys have done it! Well, the old guys have done it in 52 days and 12 hours arriving at the Pole 21:30 Canada time. No skis, no dry suits for crossing open water leads, just a pair of snowshoes, making us the first to try this way getting to the North Pole.Snowshoes are definitely better in the rough ice in the early stages of the expedition but we lost time in the second half of the expedition when the terrain was more open. Today we pushed hard for 16 hours to finish before the new moon on the 27th April, which creates high tides that crack open the ice. One comment we would make is that global warming is true and the Arctic ice is changing. The ice is thinner, we experienced May weather in April and the ice was much more broken up with lots of open water. This was the worst ice that Richard had seen in 20 years and this is backed up by the Polar Shelf Research Project and also the weather station at Resolute that has 18 years experience of monitoring ice. Our bodies are very tired but we are both very satisfied and pleased with our efforts. We have also enjoyed each other's company. Our thanks to our main sponsor Northgate PLC, other supporters and all who have taken an interest. After only one rest day in 30, our bodies are tired and snowshoes definitely require more energy than skis, sapping even more strength. We certainly are using all our 7000 calories daily. Today was a really new and unusual occasion. Richard's wife, Josee, is leading a supported trip from the North Pole to Canada and, with modern satellite communications and GPS, we were able to cross paths and exchange stories. It was a very special occasion for Richard, meeting Josee and his son Tessum, who was also on the expedition. It was surreal to come upon their tent in a blizzard! The ice has not relented and today we faced horrendous miles of ice rubble with deep, soft snow between the ice blocks. We also faced some very broken-up areas with open water leads. We crossed these using a variety of techniques, including employing paving-stone sized blocks of ice, thrown onto a metre of frozen soft snow on top of water to help support our weight as we crossed. With only 29 miles to go, as the crow flies, the next 2-3 days are going to be the big push. 21 April, 2006 / RACE AGAINST TIME!! The next few days will be a race against time, to reach the Pole before our pick-up deadline. The unseasonably bad weather of 17 days of virtually zero visibility in April has made us decide not to rely on our pick-up by a light aircraft from Canada, which requires good visibility to land on the ice. We could not wait at the Pole for the weather to clear, as we do not have enough food and fuel. The only alternative is to be picked up by a Russian helicopter from the floating ice station at 89 degrees. This station closes at the end of the month, so we have to move fast to get to the Pole in time and hope not too many obstacles are thrown in our way. Having decided to forego rest days, to meet the tight time deadline, we are both very tired. All we do is eat, sleep and travel. We are working to a 26 hour clock, to squeeze more travel into each day. As we have both suffered badly from swollen faces, due to the intense UV, we have made full face masks out of our head-overs, which make us look like bank robbers. Conrad's eyes were so swollen 2 days ago, he could hardly see. Thin ice and open water have caused delays and major detours. We have no skis and only snowshoes, that, although fantastic in rough ice, are not as good as skis when trying to cross thin ice. We confirmed their shortcomings when Richard fell completely through thin ice into the water 2 weeks ago at -33ºC. As dry snow acts like blotting paper, Richard rolled in the snow and Conrad shovelled it over him to get rid of as much water as possible. To maintain our daily mileage, Richard made the brave decision to continue travelling for 4 hours, which was tough going as his clothes were like a suit of armour and his boots like diving boots encased in ice. Since the falling in incident, we have always thoroughly tested the ice. The last few days the new ice has sagged alarmingly with snowshoes, therefore we have had to follow leads along their edges until we can find a safe crossing point. Our decision was vindicated yesterday when Conrad's snowshoe went through, but he was able to grab the edge of the lead and prevent total immersion. To maintain mileage we have simply extended our days and today we have travelled 15 hours to make 15 miles. We had a 24 hour blizzard yesterday, which forced us to spend the day in the tent. It was so strong that it was blowing the shovel out of our hands as we tried to build a wall to protect the tent.The blizzard died dramatically last night and, so as not to waste any time, we travelled for 11 hours during the night, gaining 13.8 nautical miles. Today marks the full moon, that greatly affects the tides of the Arctic ocean and creates hundreds of open water leads and pressure ridges, which have to be crossed. We had one exciting crossing, where the banks were moving in opposite directions quite quickly and the ice rubble, that we were using as a bridge, was crumbling around us. Our day ended with no wind and bright sunshine - such great contrasts during 24 hours in the Arctic. Both our faces are swelling with the sun, wind and cold; so we have made face masks out of spare material to protect ourselves. Only 158 miles to go! 9 April, 2006 / Could this be Global Warming? We suffered a setback 3 days ago, when we discovered that our damaged fuel container from a couple of weeks back had contaminated our food. We are not sure how much food is involved. The taste is unpleasant, but JUST palatable; however, the worst effect is that it makes you belch with a fuel-tasting burp? DISGUSTING! Our decision not to bring skis and to rely on snowshoes with metal crampons on the base seems to be a good one and they work incredibly well in the rough ice. It remains to be seen how they compare with skis on the slightly flatter snow near the pole. The rough ice has been hard on the crampons and we have had to replace them on all 4 snowshoes. We have no more spares. The last 6 days, we have had very bad visibility (near whiteout) and the surface conditions of soft snow have slowed progress, but we have been lucky with some frozen leads, heading north, which have allowed us to maintain mileage. We are over ½ way and less than 200 miles to go. In over 20 years' experience of the Arctic Ocean, Richard has never seen such bad conditions: could this be Global Warming, with May- type weather in April? 5 April, 2006 / Only 240 miles to go! Keeping warm in the Arctic is critical for survival. Richard's wife Joseé came up with idea of having a ball of muskox wool inside our mittens to prevent frozen fingers. The wool fills in all the excess air spaces and the fingers can burrow deep inside it. To keep warm at night we sleep in a 3 layered system. The inner plastic vapour barrier prevents moisture from the body penetrating the middle down bag, but makes for a damp and clammy environment that is not pleasant to sleep in. The outer bag acts as a barrier between the cold outside and warm middle bag but accumulates condensation, which turns to ice. Our outer bags are sorry specimens weighing an extra 2 kilos and are full of ice balls, but should recover with the April sun. For socks and underwear I stand by the Scandinavian Ullfrotte and Brynje but Richard and I both relish the warmth & lightweight "monkey man" jackets by Mountain Hardware. The last 3 days have seen less than hoped for progress due to the very difficult travelling conditions of deep soft snow, acres of ice rubble and numerous open water leads to detour around, combined with terrible visibility. 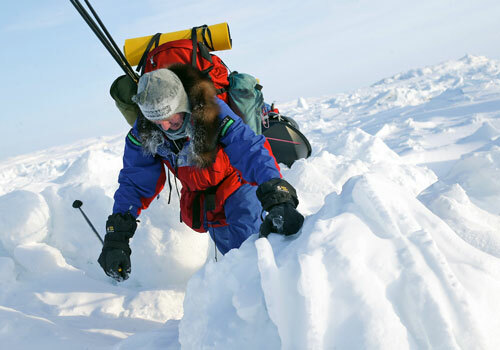 Nevertheless we today reached the 86th degree and still continue north with only 240 miles to go to reach the Pole. A clear sign that we are working hard is that we are each consuming 7000 calories a day & still tightening our waist bands a notch or two!! Our diet consists of pasta and pemmican. The pemmican is a mixture of suet, ground meat and wheat grain, based on an ancient Antarctic recipe for SLEDGE DOGS! Our pemmican mix was made more palatable by a French chef. During the day for our 3 breaks we eat high fat raw bacon, nuts and an aptly named "Zero" chocolate bar (best eaten cold!). We also eat our special secret recipe chocolate truffles that give off 700 calories each. For fibre we use a powder that expands alarmingly when mixed with water and is designed for old people (very appropriate for us!). Although the label warns of possible choking if eaten dry, it seems to do what fibre is meant to do. The most disturbing factor of our diet is that both Richard & I crave our 125 grams of pure butter eaten neat daily. To aid digestion and help the body transfer the fat content to energy we are taking an enzyme called Lipase. The evening cocktail of hot whole milk and maple sugar is a well looked forward to treat. Tomorrow marks the end of our high-octane whiskey. Monday was spent resting bodies and repairing equipment, especially Conrad's sled that needed major surgery to hold it together. Tuesday presented no major obstacles and we made 8½ nautical miles north until we came to a 100-metre open water lead where we saw a seal. We camped next to the lead and crossed it this morning when it had frozen hard. Our ONLY luxury, the whisky, is dangerously low, but apart from the whisky all other spirits are high. This afternoon we crossed a lead that was actually closing as we crossed it and pushing one layer of ice over another at about 1 foot per minute combined with loud creaking sounds. We ended the day with two pieces of chocolate to celebrate crossing the 85th degree and also achieving our best mileage to date of 9.8 nautical miles. To reach the pole by our pickup deadline we have to cover an average of 10 nautical miles per day for the next 31 days. It's the morning of 27th March. On Saturday we encountered numerous open water leads where we used a variety of techniques to cross, such as walking around, shovelling snow to bridge the gaps and also hopping from ice chunks to ice chunks. In total we lost maybe 3 hours but made up for it on Sunday when we achieved good northerly progress of 8½ nautical miles. The last 4 days have been unusually mild at -20ºC but yesterday turned to -34ºC. One of our fuel cans took a battering in rough ice and we lost a couple of litres of fuel. Yesterday morning we continued with two small heavy-laden sleds between us. Daily mileage is slowly increasing apart from yesterday that gave us no flat ice in 9 hours travel. Equipment failures continue to dog us and include the metal frame of our rucksack and various straps and attachments for snowshoes. In theory we should now have crossed the continental shelf and be passed the worst of the pack ice. Although encountering worse ice than expected we are still just on target for mileage. As per our scheduled programme today is a rest and repair day. We repaired two broken snowshoes and one of my two broken sleds with a large piece of wire. The terrain and extreme cold of -40ºC is taking its toll on our equipment. Yesterday we came to a huge area of disturbed ice that required a long detour East, which made our North and only progress only 3 nautical miles. The cold is also taking its toll on technology and cameras, so I apologise for having to send voice updates. Apart from that everything else is very well. Eventually the ice conditions are slowly improving from the constant ice rubble that we've had for the last seven days. My sledge is giving me a little concern when we wire up the holes most mornings. My real down point last night is when I discovered my half litre pee bottle had unscrewed in my sleeping bag - a really stupid mistake by me! We've just spent the last ¾ of an hour trying to dry out my wet clothes. We recorded the lowest temperatures last night at -47ºC. Although hard going, spirits are high and we're both getting on really well! It's the evening of the 9th March. We achieved 2.6 nautical miles north in 7.5 hours through very testing ice rubble, with us again having to carry one pulk at a time through the tricky sections. I've had a couple of minor setbacks: my Nikon SLR Camera has stopped working because of the cold and my inflatable mattress has a slow puncture that makes for chilly sleeping. The slightly bigger issue is the fact that I was a bit rough with one of my sledges in the ice rubble. I have split the base from end to end, which we wired together this morning. It has not however impeded progress. It was much warmer in the tent tonight at -33ºC outside and I'm enjoying the weather cocktail of milk and whisky. Richards route finding was brilliant today as he has an uncanny knack of finding the easiest and best route through this very tricky terrain. All is well with both Richard and Conrad. Ils sont partis ! Aujourd'hui, les deux hommes se sont battues 7 heures pour n'avancer que d'1 1/2 miles vers le nord! Ce sont els classiques zones de compression que tout avetnurier rencontre lorsqu'il quitte la terre ferme dans le grand nord canadien. Leurs corps s'adaptent peu à peu aux conditions de leur régime riche en graisses et calories. Fantisque ciel couleur orange ce soir, et basse temérature -40°C. L'expédition est arrivée à Resolute Bay le 2 mars. Depuis cette date, pas de nouvelle des deux hommes qui doivent faire face à des connditions météos difficiles : cela est dû au fait que la température est anormalement chaude pour la saison - 20°C seulement, ce qui entraîne la présence de nombreux nuages au-dessus des zones à survoler et particulièrement de l'endroit où le Twin Otter doit se poser. La dernière pesée : leur traîneau pèse 120 kg et leurs sacs à dos, 15kg.